Posted: Sun Jun 08, 2014 5:32 am Post subject: Fantastic Four Omnibus!!!! They were visionaries. Explorers. Imaginauts. They were Stan Lee and Jack Kirby. And like the Fantastic Four, they continually strove to overcome the impossible and achieve the extraordinary. Now, the first three years of their landmark run are collected in one oversized volume. This keepsake edition also includes all original letters pages and pinups, critical commentaries, a historical overview, and other DVD-style extras. Superstar writer Jonathan Hickman revamps and redefines Marvel's first family in an epic saga across time, space and reality! It all begins when Mr. Fantastic decides to solve everything! As the team contends with Dark Reign, an older Franklin arrives from the future with an ominous warning! 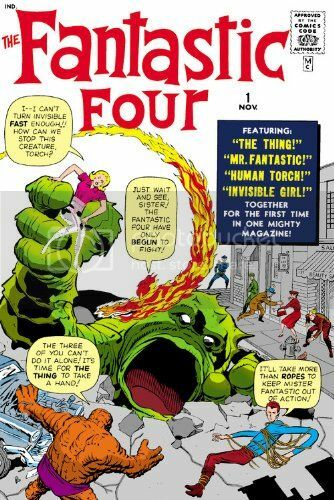 And as the Fantastic Four fight the War of the Four Cities, Mr. Fantastic assembles a band of genius youngsters. But when Nathaniel Richards returns, Galactus rises and an all-new Annihilation Wave threatens to invade from the Negative Zone, tragedy suddenly strikes. Grieving, the survivors of the Fantastic Four dissolve the team...but from its ashes rises the Future Foundation! 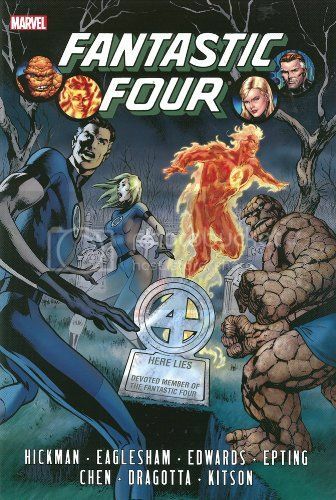 You can pick up both of these Fantastic Four collections here at Merlyn's! Remember everything is always 10% Off. Watch The HANGAR BAY SHOW - It's not the nerd-cast you deserve, it's the one you need!